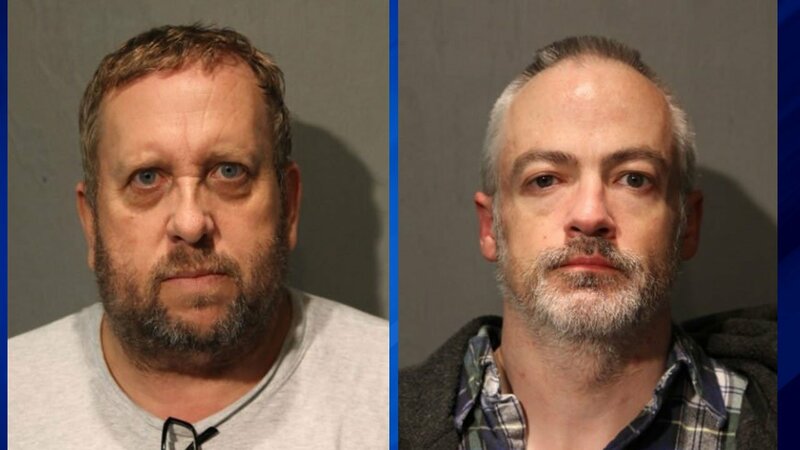 CHICAGO (WLS) -- Former Northwestern University professor Wyndham Lathem and Andrew Warren, both charged in the murder of a 26-year-old man in a River North high rise, returned to Chicago Friday night following their capture in California. Lathem and Warren arrived in the city between 10 p.m. and 12 a.m. in the custody of the Chicago Police Department. They were both formally charged with first-degree murder, police said Saturday afternoon. Chicago police said they will hold a press conference 11:45 a.m. Sunday. Andrew Warren arrives in Chicago after turning himself in to authorities in California last month in connection with the murder of a man in River North. Lathem is accused of stabbing 26-year-old Trenton Cornell-Duranleau to death on July 27 in the Grand Plaza Apartments on State Street. That same day, police in Lake Geneva said Lathem and Warren walked into the public library in town and donated $1,000 in the victim's name. Lathem was taken into custody by U.S. Marshals in Oakland, Calif., on Aug. 4. Warren was apprehended across the bay in San Francisco by local police the same night. A cosmetologist at a local salon, Cornell-Duranleau is believed to have had some sort of relationship with Lathem. His body was found only after an anonymous call to the building's front desk 15 hours after the incident. Wyndham Lathem arrives in Chicago after turning himself in to authorities in California last month in connection with the murder of a man in River North. Police: NU professor, Oxford employee wanted in River North stabbing surrender in Calif.